Having set backfires at the top of Winchester Canyon near Lizard’s Mouth and the Gun Club yesterday, fire crews continued working hard throughout the night to keep the blaze controlled. Divisions at the bottom of the mountain near the entrance to Winchester Canyon and Farren Roads had the advantage of a marine layer on their side, but the division at the top – Division A – had its work cut out. 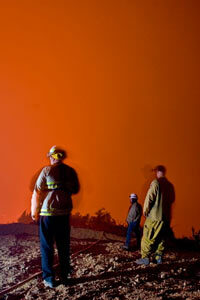 Engines and work crews dealt with hot spots in the canyon, of which there were many. 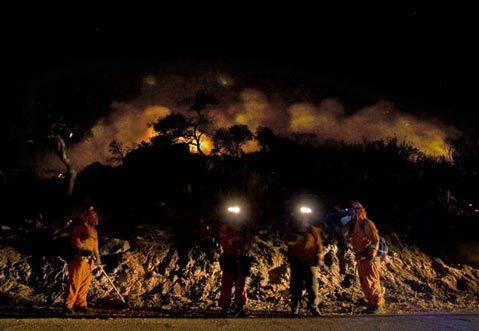 An engine crew from Alpine – a small community east of San Diego – sighted one of these fires while on standby behind the main line at about 3 a.m. Within minutes, they had backed their rig into the area and suppressed the flames with water. Handheld radios were abuzz with traffic related to the larger fire in the canyon, which took on the appearance of a vignette of hell. 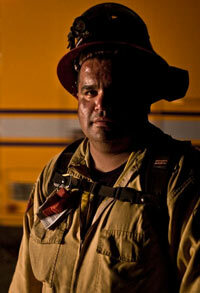 Captain George Nunez, from Valyermo, CA, who manages a team of inmate firefighters. “It was going pretty good until about [2 a.m.],” said division chief Scott Goodwin early this morning. “Then the wind changed. It’s still going pretty well. It hasn’t come over the line,” he said, referring to West Camino Cielo Road, which has been established as a defensive line to keep the fire from crossing over onto the back side of the coast range, exposing it to a huge expanse of fuel and the mercy of unpredictable winds. “There’s a lot of work being done down there by type 3 engines (portable, four wheel drive trucks with 500-gallon tanks on board) and hand crews.” As most of it was still on fire, the temperature near the canyon was noticeably warmer. Goodwin said that by day, massive amounts of pink retardant can be seen coating its floor. Standing by the gun club, Lake Cachuma and the lights of the Santa Ynez Valley could be seen, along with the stars, creating a disparate backdrop against which the smoke and fire were set. Left to right– Division I Chief Scott Goodwin, Captain von Mason, and an unknown fire captain coordinate work on the fire in Winchester canyon. As larger crews worked in the valley, connected to their captains and chiefs via radio, some smaller units with type 3 trucks – such as a four man team from Alpine, located east of San Diego – kept an eye out for, and dealt with spot fires. Some of the hand crews were comprised of inmates from a Los Angeles County correctional farm. A program available for physically fit inmates with a low risk for escape, it gives people who have not been convicted of violent, sexual misconduct, or arson crimes a chance to work outside the prison setting while earning credit for early release. “Any time you do here is better than time behind the wall,” said Captain Von Mock, who was in charge of a team of 17 inmates. “Here you’re in a smaller setting and there’s better food.” The inmates working on the line near the Gun Club worked hard, but most seemed genuinely grateful to be there, and a few even expressed interest in pursuing careers as fire fighters when their sentences are up. CBS TV crew sets up for a 4am live broadcast. Amidst the organized chaos of setting back fires, New York-based CBS news crews set up lighting and equipment for a live broadcast of the Early Show, featuring weather man Dave Price, which was aired this morning at 4 a.m. (7 a.m.. EST). With lights set up in the smoldering wreckage of what was once a stand of dense chaparral on the side of West Camino Cielo Road, it took some time for them to figure out how to suspend the wires above the ground so that they would not melt. Embers still glowed and even those wearing boots could feel the heat.